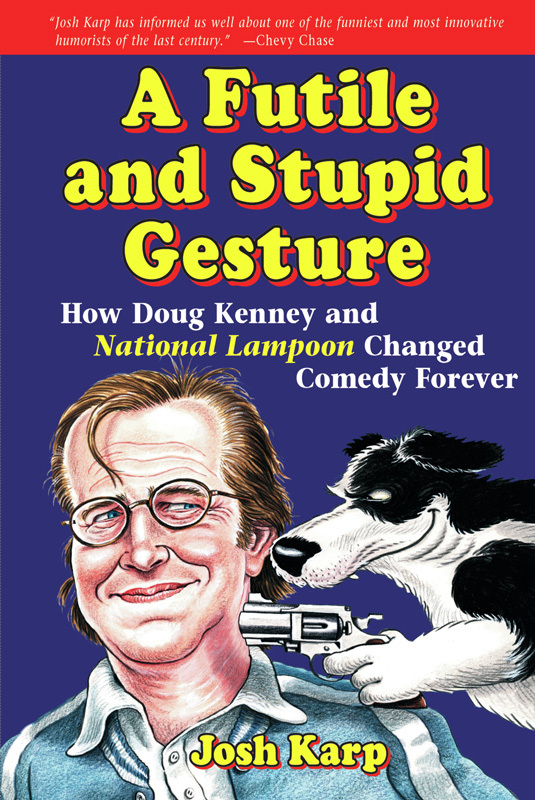 Josh Karp’s 2006 release A Futile and Stupid Gesture chronicled the life of National Lampoon co-founder Doug Kenney. The ultimate biography of National Lampoon and its cofounder Doug Kenney, this book offers the first complete history of the immensely popular magazine and its brilliant and eccentric characters. With wonderful stories of the comedy scene in New York City in the 1970s and National Lampoon’s place at the center of it, this chronicle shares how the magazine spawned a popular radio show and two long-running theatrical productions that helped launch the careers of John Belushi, Bill Murray, Chevy Chase, and Gilda Radner and went on to inspire Saturday Night Live. More than 130 interviews were conducted with people connected to Kenney and the magazine, including Chevy Chase, John Hughes, P. J. O’Rourke, Tony Hendra, Sean Kelly, Chris Miller, and Bruce McCall. These interviews and behind-the-scene stories about the making of both Animal House and Caddyshack help to capture the nostalgia, humor, and popular culture that National Lampoon inspires.